The scandal over zero-hours employment continues to grow as the widespread use of this zero-rights way of contracting part-time workers becomes apparent. 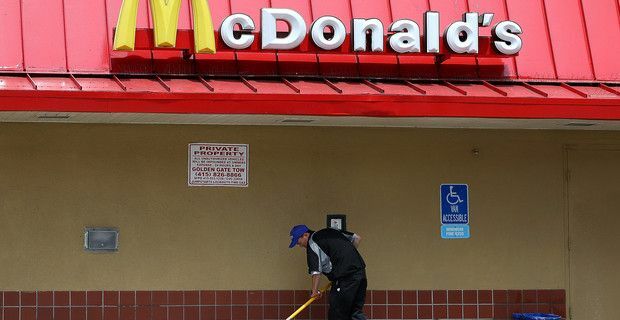 The latest company to be exposed is McDonald's, which admits to employing 90,000 of its restaurant staff on these terms. That amounts to more than 82,000 staff in the UK having no fixed terms for their shifts, no minimum hours, their employment from week to week essentially left to the whim of a branch manager. Back in the last century, Canadian writer Douglas Coupland coined the term "McJobs" to refer to worthless, part-time, menial work. It seems that McDonald's used that as a template for their employment practices. Politicians critical of those companies using zero-hours contracts are already out of their depth as the sheer scale of this kind of employment is revealed, covering around a million workers in the UK. Bumbling business secretary Vince Cable has threatened legislation, but he was quickly shouted down by the Institute of Directors. They argue that a ban on what they euphemistically call a "flexible labour market" would damage the UK economy. Labour MP Andy Sawford called on McDonald's to change its policy. "McDonald's could lead on addressing this issue," he said. "There will be some employees working 20 to 30 hours a week, week in week out, and it is indefensible not to put those people on contracts." McDonald's are far from the only culprit. The Guardian has published a contract offered by the Subway sandwich franchise. It reads in part: "The company has no duty to provide you with work. Your hours of work are not predetermined and will be notified to you on a weekly basis as soon as is reasonably practicable in advance by your store manager." It seems that the cost of a cheap burger or a sandwich lunch deal is the continued exploitation of lowly-paid service sector employees. What experience and qualifications do you need for a restaurant job?